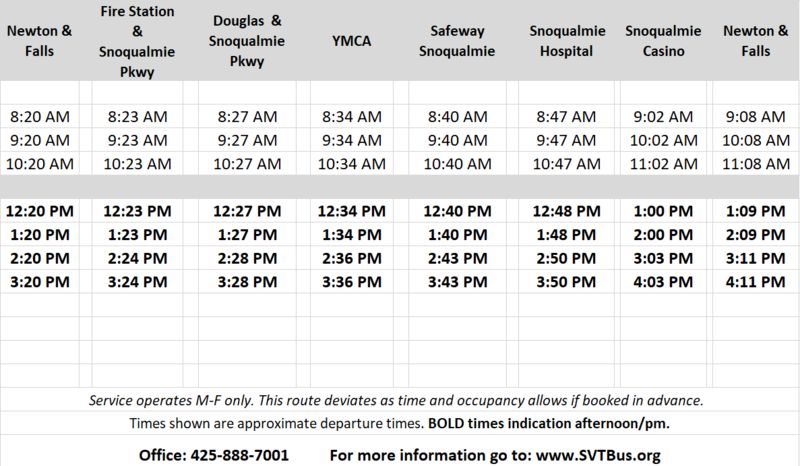 Connecting the neighborhoods and businesses of the city, Snoqualmie Valley Transportation is now providing hourly bus service between historic downtown Snoqualmie and Snoqualmie Ridge. The Ridge Loop starts at the corner of SE Newton and Railroad Avenue, bringing people to events and appointments at the Snoqualmie Valley YMCA, Safeway, Snoqualmie Valley Hospital and the Snoqualmie Casino. Catch the Ridge Loop bus at any of its regular stops, weekdays between 7 a.m. and 4 p.m. for a $1 suggested donation. Riders can also flag down the bus at any point along its mapped route. The bus leaves downtown Snoqualmie at 7:20 a.m., 8:20, 9:20 and 10:20 a.m., and 12:20, 1:20, 2:20 and 3:20 p.m. The bus is ADA accessible and also equipped with a bike rack, giving cyclists a faster, safer alternative to pedaling up Snoqualmie Parkway. Children under the age of 13 must be accompanied by an adult to ride the bus. Learn more about the Ridge Loop, or any of Snoqualmie Valley Transportation’s other services, including a fixed-route loop between Snoqualmie and North Bend, a loop from North Bend to Rattlesnake Lake, door-to-door service throughout the valley (appointment required) and the Valley Shuttle service from North Bend to Duvall, visit www.svtbus.org, or call 425-888-7001. About Snoqualmie Valley Transportation: Snoqualmie Valley Transportation (SVT) is a project of Mt. Si Senior Center. SVT began its services in 2003 with funding assistance from Snoqualmie Indian Tribe, King County Metro Transit, and the Washington State Department of Transportation.